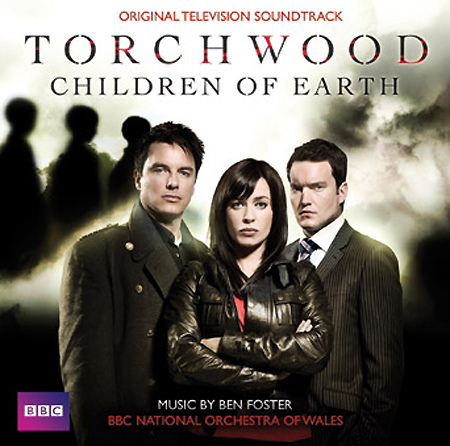 The soundtrack to Torchwood - Children of Earth is an highly emotive, adrenalin-fuelled contemporary epic score composed by Ben Foster. The album features music highlights from Torchwood series three, the spin-off series from Doctor Who writer Russell T Davies. Ben Foster is best-known for his work as orchestrator and conductor on Doctor Who and as composer for Torchwood. His work on Torchwood has earned him two nominations for best soundtrack at the BAFTA Cymru Awards. Ben started his film and TV career with scoring over thirty short films for various European directors and subsequently writing for a variety of television programmes. Most recently he has worked on big budget films The Mummy 3 - Tomb of the Dragon Emperor, Glorious 39, Is Anybody There? and Hoodwinked 2. In May 2009 he conducted the London Soundtrack Orchestra in the first complete performance of Herrmann's score to Psycho live with the film. Ben was chairman of the judging panel for BBC Young Musician of the Year 2008 and is a regular contributor to various programmes including Blue Peter and Clash for CBBC. Due to the popularity of the series, Torchwood has made a swift move from BBC Three to BBC Two, with the new series, Torchwood - Children of Earth, finding itself on BBC One. Children of Earth, an epic story to be told over five nights, promises to be Torchwood's greatest adventure yet. Many new titles have been added to Incoming this week. New and augmented titles include: the third series of Stephen Fry's Sunday-night lawyer drama Kingdom; the first series of Law & Order: UK; the eleventh series of venerable crime drama Midsomer Murders; season eight of Family Guy (as well as the customary cumulative box set); the fifth season of House (aka House MD; the fourth series of Supernatural on DVD and Blu-ray. There's also the first season of five's quirky crime drama The Mentalist; the Kenneth Williams biopic Fantabulosa! ; the HR Pufnstuf movie; CGI animated hit Monsters vs Aliens on DVD and Blu-ray; the fourth season of Bones (look out for David Boreanaz on the chat circuit this week); science-fiction chase movie Push, on DVD and Blu-ray (check out the groovy lenticular sleeve art at Play.com! ); arthouse hit The Class; the first season of HBO's vampires-among-us series True Blood; another edition of cult favourite Blood on Satan's Claw; the second season of David Duchovny's terrific adult comedy series Californication; the Belle De Jour / Belle Toujours double-bill; and the second season of geek comedy The Big Bang Theory. Dozens - perhaps hundreds - of new titles have been added to our forthcoming releases database, Incoming in the last week. As always, my thanks go to Graves, who is responsible for the vast bulk of the work at the moment. New titles include: Pete Walker's Giallo Die Screaming, Marianne; Smallville - Season 8 on Blu-ray and DVD; the third season of Heroes on Blu-ray and DVD; Charlie Kaufman's mind-bender Synecdoche, New York; the second season of Chuck; cult hit science-fiction action movie Outlander on DVD and Blu-ray; Stewart Lee's Comedy Vehicle; the first season of Joss Whedon's Dollhouse; a four-film Fast & Furious box set in DVD, Blu-ray and Limited Edition Blu-ray editions; British comedy The Boat That Rocked on Blu-ray and DVD; season 12 of The Simpsons (in both regular and limited edition (Comic Book Guy-shaped) versions); Nick Moran's Joe Meek biopic Telstar; a mammoth twenty-five disc DVD box set containing the complete Battlestar Galactica (it looks like a Blu-ray version will follow - Play.com have a good picture of the set - it looks like it'll be a lot less elaborate than the US edition); the most recent series of Peep Show, and the customary cumulative box set; and The Peter Serafinowicz Show, which is now being tentatively listed by several etailers. Also newly-listed are a whole bunch of catalogue Blu-ray titles, including Mike Nichols' werewolf movie, Wolf, John Carpenter's Escape from LA, 48 Hrs, Luis Bunuel's masterpiece Belle De Jour, Shaolin Soccer, Van Damme's Universal Soldier, David Lynch's The Elephant Man; Last Year In Marienbad, Kurosawa's Ran, The Deer Hunter, and Joseph Losey's haunting romance The Go-Between. Luc Besson fans have a lot to look forward to on September the 14th, as several titles are being released on Blu-ray for the first time in the UK: Nikita, Atlantis, Le Dernier Combat, The Big Blue, Angel-A and Leon (aka The Professional). According to HMV Leon will be the director's cut. No details on the other titles (particularly which version of The Big Blue this will be). These are also being re-released on DVD. I've also added details of the bonus features that are on the Franklyn Blu-ray disc, which is being released on June the 22nd.